The NZ left has already jumped on the Tongan revolutionary bandwagon. 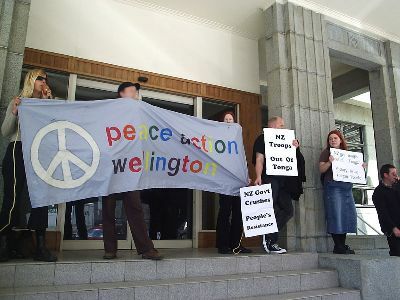 Peace Action Wellington opposes the deployment of the New Zealand military and police to Tonga and will protest outside the New Zealand Defence Headquarters in Stout Street, Wellington, today (Monday, 20th November) from 12:30pm. "These troops are serving the interests of the feudal class in Tonga, while crushing people's desire for change." "We stand in solidarity with the people's resistance in Tonga and support them in their struggle for self determination," said Valerie Morse. Tongan Bloggers Condemn "Democracy Movement"